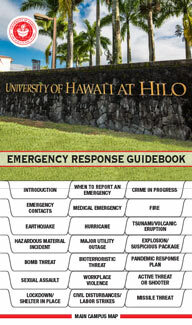 The University of Hawaiʻi at Hilo (UH Hilo) takes student safety seriously. The following policy and procedures have been established to assist in locating missing UH Hilo students who reside in on‐campus housing. The purpose of this policy and procedures is to promote the safety and welfare of UH Hilo students in accordance with the requirements of the Higher Education Opportunity Act of 2008. If an individual has reason to believe that a student who legally resides in on‐campus housing is missing, they should immediately notify Campus Security (808) 932‐7013, the Vice Chancellor for Student Affairs (808) 932-7445, or the University Housing Office (808) 932-7403. This team will work together to share information under the leadership and coordination of the Director of Campus Security. For students who do not reside on‐campus and are reported missing, the University may provide reasonable response and assistance as resources and time allow. Obtain information from the reporting individual about the student, such as a physical description, including clothes he/she may have been wearing when last seen; who he/she may be with or where he/she may be; his/her physical and mental well being; and the reasons he/she believes the student is missing. Attempt to contact the student via his/her cell phone (if available) and/or email address. Check the student’s room to see if he/she is present. The Dean of Students will contact the Confidential Contact identified by the student (see below). If the missing student is under the age of 18 and is not an emancipated individual, the Dean of Students will notify the student’s custodial parent or legal guardian. The Director of Campus Security will notify the local law enforcement agency. The Dean of Students will notify the Vice Chancellor for Student Affairs. This policy does not preclude the University from implementing the procedures described above in less than 24 hours if circumstances warrant a faster implementation. the confidential contact information will be accessible only by authorized campus officials and law enforcement officers in furtherance of a missing person investigation. In cases of a missing student, local law enforcement agency may provide information to the media that is designed to obtain public assistance in the search for a missing student. In doing so, the local law enforcement agency will consult with UH Hilo University Relations. Any media requests to the University will be directed to the University Relations office. August 13, 2010, updated February 18, 2015.